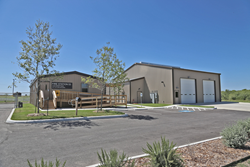 Palomar Modular Buildings completed construction of a two-module, 1,792 square foot modular building for the City of San Antonio’s Fire Station #53. The modular building will serve as living quarters and offices for the firefighters stationed at the facility. The new fire station is located in the 14000 block of Conop Road on the city’s southeast side. The modular building floor plan includes bunk rooms, offices, kitchen, dining, and recreation areas. The two-module building features an exterior finish and roof composed of 29-gauge steel paneling, a high efficiency HVAC system, heavy duty high traffic doors, durable and low maintenance floor and wall coverings, and motion light sensors.